Third album, following Tardigrades Will Inherit The Earth. Guests include Alex Lifeson (Rush)! 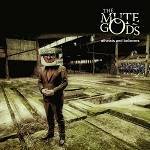 More information: The Mute Gods third album Atheists And Believers is a powerful follow up to Tardigrades Will Inherit The Earth. The trio of Nick Beggs, Roger King and Marco Minnemann are joined by special guests including Alex Lifeson, Craig Blundell, Rob Townsend and Lula Beggs.